Enjoy strolling through the 32nd Annual Scarecrow Competition and Display which features more than 100 colorful scarecrow creations through October 24. The eclectic scarecrows hanging around—figuratively and literally—at Peddler’s Village are not your typical straw concoctions “off to the see the wizard.” Instead, they are most wonderfully creative works of art that have participants vying for over $5,000 in cash prizes for the Village’s 32nd annual Scarecrow Competition and Display. If you have not been, it’s an entertaining way to spend a fall afternoon in beautiful Bucks County with friends or family. The competition runs through Sunday, October 24th. When: Runs through Sunday, October 24. Create the person, place or thing – past, present or future that says “Pennsylvania” to you! PA possibilities are endless!! 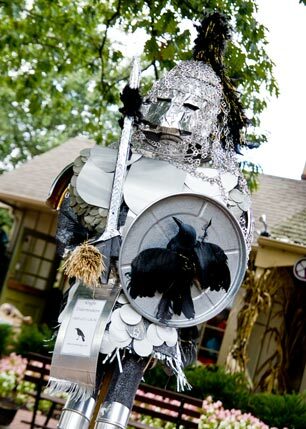 Think outside the box on this one—not necessarily a “scarecrow”—more like a cutting edge creation for the garden. You are only limited by your imagination! Bigger-than-life scarecrow creations are displayed outdoors and compete for over $5,000 in cash prizes. A combination of two old favorites! 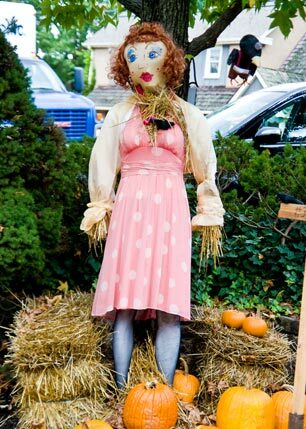 Pay homage to the scarecrows that have been “scaring crows” from the farmer’s fields and gardens for centuries. You may choose to add parts that move or make noise when the wind gusts to make it a true whirligig—either way your scarecrow has it’s work cut out for it here in the Village. Make your scarecrow a group project—school, church, office, club, scout troop, neighborhood, etc. Put your creative thinking caps on and conjure up a winner! Open a world of possibilities as you create a scarecrow interpretation of your favorite television character – human, animal or animated! Kids 12 and under can enter and should do the majority of creation themselves in a category that gives kids the opportunity to compete with their peers. Peddler’s Village has been a popular leisure destination for 48 years, attracting 1.8 million visitors annually. Located in the heart of beautiful Bucks County, Peddler’s Village consists of 70 unique specialty shops, 5 restaurants, the 70-room Golden Plough Inn, and the Giggleberry Fair family entertainment center. Enjoy free seasonal festivals and year-round family events in our colonial-style village with award winning gardens. More information is available on the Peddler’s Village website at www.peddlersvillage.com or at 215-794-4000. « Buzz: The 50th Annual Shipley Shops!